One thing that is common in the world of consumer electronics is the need to perform some kind of custom logic feature, from button user interfaces to LCD displays and flashing lights. If manufacturers needed to create their own custom logic chips to perform these functions, consumer electronics would be prohibitively expensive. So for DECADES microcontrollers have been used inside common devices to perform the necessary operation in response to button clicks and remote control codes, GREATLY reducing the cost, and the price to the end user. Aside from the OBVIOUS uses, it is ALSO possible to use existing inexpensive microcontrollers to substitute for a large number of electronic components (or a custom-developed chip). And in certain cases, it may even be LESS EXPENSIVE (in the long run) to use a microcontroller in the design to substitute for EXISTING devices. Let's take the example of the S.F.T. Power Supply, a prototype device that uses a microcontroller to regulate 4 separate voltages at the same time. Sure, switching power supplies aren't new, nor is using PWM to control an output voltage, or an A:D converter to measure a voltage. 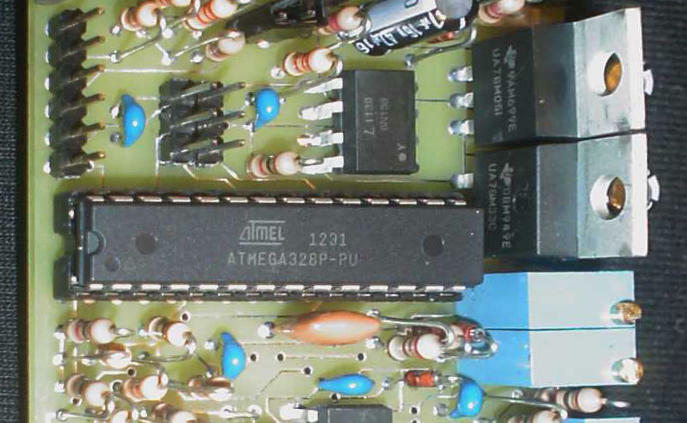 PWM and A:D converters are built-in features in the AVR processors made by Atmel. Taking advantage of them in NEW ways, however, is part of the power of the microcontroller. That is, USING SOFTWARE TO REPLACE HARDWARE. The S.F.T. Power Supply still need a number of external components to do its job. Most of these are discrete components like power transistors, diodes, resistors, capacitors, and filter chokes. These would be required ANYWAY if a dedicated switching power supply control chip were used, such as one of those produced by Linear Technology, you would STILL need to surround the somewhat-expensive controller device with a number of standard off-the-shelf discrete components for it to work. By using a microcontroller, with appropriate software, to do what a switching power supply controller does, the number of components on the board probably won't change much. HOWEVER, the total cost of the unit is likely to be LOWER than it was before. By my comparison, a typical AVR processor costs LESS THAN HALF of the cost of a typical switching power supply device. You, the reader, are invited to do similar comparisons. Of course, this means writing control software, which can take quite a bit of time. But if it gives you a competitive advantage, it's definitely worth it. A lot of engineering work is devoted to saving PENNIES on the B.O.M. cost, and if you have to spend THAT kind of money engineering a few cents, think of what it would be worth to save SEVERAL DOLLARS. When manufacturing in large quantities, the 'fixed cost' of the software engineering essentially becomes NEGLIGIBLE with respect to the per-unit B.O.M. costs, and the reduction in retail sales price (or improved margin) will reflect the pennies or single dollar savings per unit. It is why it's worth spending many tens of thousands of dollars on this kind of engineering work. Using the S.F.T. Power Supply as a model, a microcontroller is typically a RUN TIME device that polls measurements and makes adjustments to control whatever devices it's designed to control. In some cases it makes more sense to use interrupts and ISRs, but those would more likely be specialized applications and NOT the 'general use'. Since AVR processors CAN do ISRs (and I do make use of an ISR in the S.F.T. Synth project) they are still an option for when such a thing is needed. DoLCDUpdates(); // update the display with live voltage measurements, etc. // TODO:  anything else per loop? Each loop performs a set of measurements, then controls the PWM outputs that drive the regulator outputs. If an overload condition was detected, the 'overload' flag is set, the PWM outputs are shut down, and the LCD display indicates the overload condition (after 9 seconds the prototype auto-resets). There is also a special 'calibrate' mode that allows you to run the device without damaging anything so that you might calibrate it. Finally, the LCD display is updated periodically to indicate various parameters, such as the current regulator output, or the regulator setting that is currently being 'dialed in'. One important thing to consider about microcontrollers is that they are GENERAL PURPOSE devices, and may not have the kinds of response time or features necessary to provide proper control. Sometimes it is possible to engineer around this, sometimes not. In the case of the S.F.T. Power Supply, larger capacitors and inductors are necessary to accomodate the relatively slow switching speeds of the PWM output (typically, 8khz). Even though it is possible to control 4 outputs, there are delays that MIGHT allow a transient voltage to exceed the specifications of the downstream components. Ideally the components MUST filter out such transients, or some other external circuit (such as a crowbar) must be employed to prevent this from happening. Transient response is an important design criteria since a voltage DIP (which might reset a CPU) is just as bad as a voltage SURGE (which might fry power-sensitive devices). So using a microcontroller in POWER SENSITIVE situations might not be the best idea. However, if the microcontroller were to control the MAIN voltages, and a specialized regulator controls the POWER SENSITIVE voltages, you can end up with a hybrid solution that takes advantage of "The Best of Both Worlds". So a microcontroller-based solution is NOT a panacea "one-size-fits-all" solution. But careful design of a microcontroller-based solution CAN reduce the cost of a device, and maybe even give it other capabilities that were not previously possible.